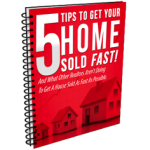 Will Your Home Sell Quickly? There are many different circumstances that can determine how quickly your home will sell when put on the market. First off you’ll want to ask your agent what the current days on market average is for homes in your area. Some areas obviously sell much quicker than others and some areas are completely different from the National Market. Meaning even if it’s a Buyer’s Market in most areas your particular area could be a Seller’s Market or vice versa. In any case nobody can assure you how quickly your home will sell. But if you check the list below you can help with speeding up the process in many ways. In other ways it’s simply a matter of things that you cannot control, such as location, neighborhood, and current market situation. It may seem obvious as to what would make a home sell quickly but sometimes you can overlook things when you’re personally involved. Some things you can control; while others you cannot. What do people generally want in a home that would make your house an attractive and quick selling home? A turnkey home that gives the buyer the option to move in almost immediately because the house is in excellent condition. Aesthetically pleasing fixes that are taken care of both inside and out – including curb appeal and indoor painting and flooring updates. Priced to sell – not overpriced and not underpriced (many times if your home is one that is going to be a quick seller it’s not unusual to see a “price bidding war” go on between buyers). A neighborhood that is highly sought after. Location that is convenient to amenities or the ability to get to amenities easily (close distance to shopping areas, hospitals, doctors, etc. without being “too close”). Additional amenities such as central air, off-street parking, garage, living on a dead-end streets, cul-de-sacs, and low traffic areas. Newer roofing, heating and air units, well maintained house. Needless to say everyone has their own dream home and usually no one home fits every aspect of a person’s dream unless they’re building it themselves. The reality is that if you know what the average buyer is looking for and use the guidance of your agent to help you there is no reason why your home won’t sell quickly in most markets.